Over a period of five years, filmmaker Sarah George chronicled the lives of several modern-day train hoppers, a vanishing culture to which she also belongs. These individualists choose to eschew the comforts of modern American life to pursue the freedom and unpredictability of riding the rails, a choice that reflects both their lifestyle preference and a personal philosophy that is often based on environmental concerns. Through Sarah's insightful interviews, the modern hobos discuss their unique experiences and the incredible thrill of train-hopping. 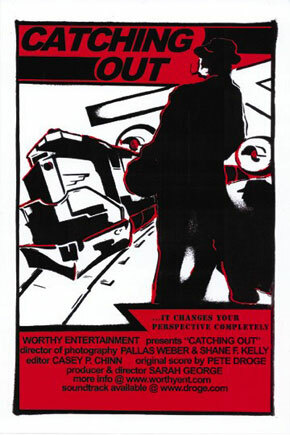 Producer/Director, Sarah George is making her directorial debut with the documentary film, Catching Out. In the summer of 1993, George stumbled into media production by making a video documentary called God's Trombone. With no prior production experience, she received a producer credit after completing a cross-country road trip and ushering the project through post-production. She considers working on God's Trombone a life-altering experience, and, consequently, she decided to become a documentary filmmaker. In 1995, George received a grant from the King County Arts Commission to make a documentary about contemporary hoboes. After exploring the topic on her first trainhopping excursion, she became an enthusiastic rail rider. Known on the rails as "San Luis," she has traveled over 10,000 miles by freight. At the 1996 National Hobo Convention, "San Luis" was honored as a "Knight of the Road" by Luther the Jet, the presiding King of the Hobos. To support the docmaking habit, George works freelance in the film industry. Her credits include Line Producer of the narrative short films Nice Day for No Rain, Confidence, and Stall. She has numerous credits as a Location Manager, Production Manager, and Coordinator for feature films, episodic television, commercials, and music videos. 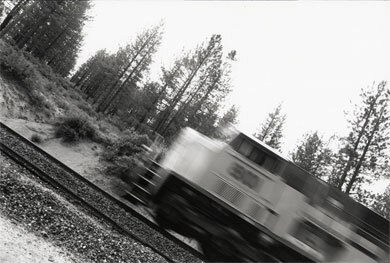 In 1997, George received the Pacific Pioneer Fund's grant for "Emerging Documentary Filmmakers." She also received an NEA fellowship administered by the Washington State non-profit organization, Artists' Trust.